‘Kokoda Day’ could be a source of intense pride for all Papua New Guineans. It has the potential to emulate the commemorative status of Anzac Day in Australia. It will also provide a strong incentive for Australians to visit PNG for the commemoration and all it represents. But more importantly it provides a status of recognition for the Papua and New Guinea wartime carriers – the unsung heroes of the campaigns they supported throughout Papua and New Guinea. Australia was unprepared for the war in the Pacific in 1942. Our faith in ‘great and powerful friends’ coming to our aid in the event of Japan entering the war was shattered with the sinking of HMS Prince of Wales and Repulse near Singapore on 10 December 1941 and the secret deal struck by UK Prime Minister Winston Churchill and American President Franklin Roosevelt for American aid to be directed to the European theatre of operations at the expense of the South West Pacific. The defence of Australia and its mandated territory of Papua and New Guinea was dependent on untrained militia forces and a small band of New Guinea Rifles as our experienced AIF units were returning from Europe to meet the new threat. Resources were so scarce in New Guinea that young males were forcibly recruited to support the war effort[i]. Many of these men from remote mountain villagers had no idea of the war and were conscripted against their will. They were told that men from Japan were the enemy. For many of these men other villagers living in remote tribal lands were also considered ‘enemy’. One can only imagine the fear and uncertainty they felt as they were forcibly marched away from their families and clans to fight in ‘our’ war against Japan[ii]. It has been estimated that some 10,000 PNG nationals served as Carriers in support of the Australians during the Kokoda campaign in 1942. A further 42,000 are estimated to have been indentured to support Australian troops in the Milne Bay and the Buna/Gona campaigns. They were paid 10 shillings per month. The issue of compensation remains a vexed issue more than 70 years after the war. While the Australian government paid some compensation for property damage to PNG nationals between 1944 and 1957 the wartime carriers were excluded from receiving any such benefits under the prevailing legislation. In 1980 they were also deemed to be ineligible for the PNG War Gratuity Scheme for ex-Servicemen. And they were deemed to be ineligible for a medal. In the eyes of post-war bureaucrats they were both nameless and invisible. For those who command a desk in far flung bureaucratic empires and academic institutions the care of a Papuan in a remote jungle is something they will never comprehend. For those who have been carried to safety on a stretcher over inhospitable terrain the unconditional care of the bearers will never be forgotten. Papuan Infantry Battalion soldiers were recruited into their army. They were issued with uniforms and weapons. They were decorated with campaign medals and marched proudly behind regimental colours on commemorative occasions such as Anzac Day and Remembrance Day. They were known as ‘green shadows’ because of their mastery of their jungle environment. On the other hand Papua and New Guinea wartime carriers were indentured, often at gunpoint, to support a war they didn’t understand. They were never issued with a uniform and never enjoyed the esprit de corps of belonging to a unit. They were essentially native groups of nameless labourers. Their job was to carry supplies forward to our troops. Carrying our wounded back on the return journey was not part of their job description. But such is their nature of care that, when they came across a soldier who could go no further and who faced a certain, anonymous death on the side of a muddy, bloody track, they would stop, assemble a stretcher from bush materials, load him onto their shoulders and begin a journey that took up to two weeks to complete. When night fell and temperatures dropped they would lay on each side of their’ white stranger’ and try to keep him warm – sharing the few grams of rice they were rationed with him. They were were poorly equipped, underfed, often overloaded and paid less than a subsistence wage. The spirit of their commitment was captured in a poem by one of their patients who owed his life to their care – Sapper Bert Beros. Many of them lie in unmarked graves alongside jungle tracks far from their village homes. They have no grave, They have no spiritual home. This can be rectified by the PNG Government proclaiming a special day to commemorate their service and sacrifice – Kokoda Day. Whilst Remembrance Day commemorates the service of Papua New Guinean soldier who served, and those who sacrificed their lives in action during the Pacific War and the Bougainville crisis, Kokoda Day would be dedicated to the service of the wartime carriers who were never issued with a uniform and never received a medal. a service at a traditional cenotaph[iv] in Port Moresby[v]. The Kokoda campaign began with a full scale attack on the Australian 39th Militia Battalion on 29 July 1942. The campaign lasted three months as the Australians were pushed back to the last line of defence on Imita Ridge. The Australians rallied at this point and pushed the Japanese back across the trail. Kokoda was recaptured on 2nd November 1942 and the Australian flag was raised at a service on the Kokoda plateau the following day. The flag raising ceremony symbolised the turning of the tide in the Pacific War. It also symbolises the service and sacrifice made by wartime carriers in all campaigns throughout PNG. This victory would not have been possible without the vital support of these carriers across the Kokoda Trail. In addition to their contribution to the war effort hundreds of Australian soldiers owe their lives to the selfless sacrifice of the carriers who guided and carried them to safety over inhospitable jungle terrain in the most adverse of circumstances. The term ‘Kokoda’ now has a resonance equal to ‘Anzac’ in marketing terms. The fact that more than 40 000 Australians have trekked across the trail over the past decade is testimony to this fact. There are many thousands more who would make a pilgrimage to Kokoda without having to trek because of the age and/or physical condition. All they need is the opportunity to plan and commit to it. ‘Kokoda Day’ will provide that opportunity. A marketing package for Oro Province would be developed around a week of activities culminating in a ‘Raising of the Flag’ ceremony on the plateau on the 3rd of November each year. Trek operators would schedule treks to arrive in Kokoda from Owers Corner on the night before the ceremony. Short treks from Kokoda to Isurava, across to Abuari and back to Kokoda via the eastern side of the range could be organised for those who do not have time or the level of fitness to complete the entire Kokoda Trail. This would also include villages on the Eastern side of the range (Hagutawa, Kaele, Fela, Pelai and Kanandara) who currently receive no benefits from the Kokoda trekking industry. Short tours can also be organised for the battlesites of Oivi-Goiari and the beachheads at Buna and Gona. Visitors could be given an opportunity to extend their stay at Tufi Resort. Kokoda Day also provides an opportunity to showcase Orokaiva culture in regard to the staging of traditional dances, sing-sings together with markets for local arts and craft. The afternoon of the ceremony could be devoted to a ‘Province of Origin’ rugby league match between Central and Oro Province in their own ‘blue’ and ‘maroon’ jerseys on the Kokoda plateau. This could be a joint promotion between PNG Tourism, Air Niugini, NRL/PNGNRL and tour operators. Kokoda Day provides an opportunity for PNG to create their own national remembrance in accordance with Commonwealth tradition. 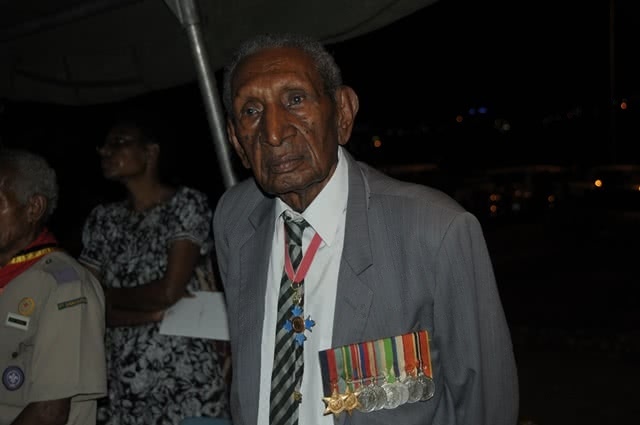 At the end of the war Sergeant Moide’s unit was awarded a battle honour; he and his fellow Papuan soldiers were issued with campaign medals; and they have their own Remembrance Park. Their wartime carriers were never honoured in a similar way. They had no units, no uniforms, no battle honour, no repatriation and they have no spiritual home. Many lie in unmarked jungle graves in provinces far beyond their traditional village homes. Young Papua New Guineans are becoming more conscious and increasingly proud of their wartime heritage. Thought should be given to the creation of a traditional cenotaph in the National capital – a spiritual tomb for those who never returned to their village. The form and location of such a significant national structure would be the subject of a separate resolution by the PNG Government. A traditional cenotaph would be the focus for national commemoration in Port Moresby. It could be located in an area that allows for the future development of a Wartime Educational Centre and park to tell the PNG story. Education centres at the Shrine of Remembrance in Melbourne and the one under construction at the Anzac Memorial in Sydney provide good models for what it possible. Education is a key building block for national pride. Wartime carriers were indentured from all over Papua and New Guinea to support the war effort along the Kokoda Trail, the Huon Peninsula, the Markham–Ramu Valley and Shaggy Ridge. A Kokoda Day Flag Raising Service in each school on 3rd November supported by an appropriate educational package would be an important component in the further development of national pride in PNG. 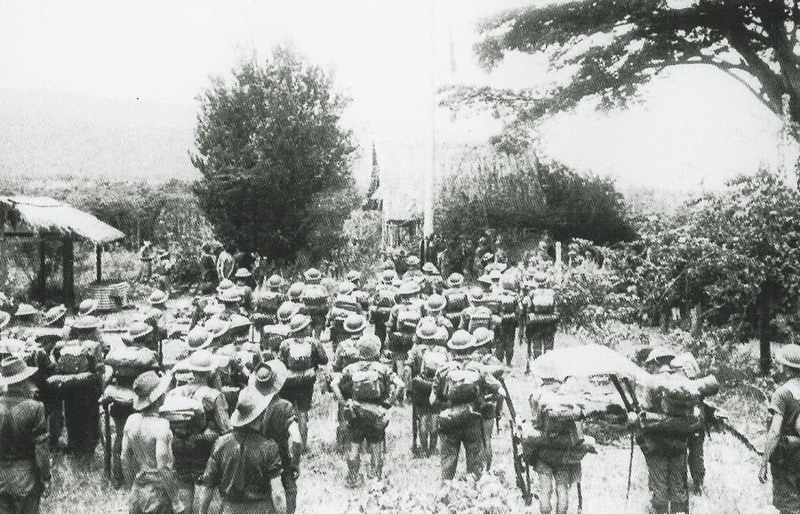 The Australian army would have been defeated in the Kokoda campaign if they had not received vital logistic support from the New Guinea wartime carriers. Hundreds would have died of their wounds and tropical illnesses if they had not been carried off the trail. These wartime carriers have never been officially recognised. The Australian government specifically excluded them from benefits under legislation for compensation of PNG nationals who served in the Defence Force. In 1980 they were also deemed to be ineligible for the PNG War Gratuity Scheme for ex-Servicemen. The service of the wartime carriers and the sacrifices they made towards the allied victories in Papua New Guinea should be honoured and enshrined in a special day dedicated to their memory. The most appropriate day is November 3 as the Australian flag would never have been raised on the Kokoda plateau if it had not been for their service. ‘Kokoda Day’ be proclaimed on 3rd November each year to commemorate the service and sacrifice of the New Guinea Wartime Carriers. [ii] According to wartime journalist, Osmar White[ii]: ‘ANGAU contrived a maximum mobilization and use of native labour. At the critical period, its method of conscription was even more arbitrary than German recruiting in the early days. In some villages every able-bodied male over the approximate age of sixteen years was rounded up, transported to the clearing centres, and thence drafted to whatever type of work had priority in the immediate emergency. Brutal disciplinary measures had often to be taken in the field; but when the first and worst crises of invasion were surmounted, ANGAU did what ti could to conserve the life and health of its native levies and to maintain the viability of native communities depleted of 40 or 50 per cent of their able-bodied men. Under military rule, the labourers’ health was more carefully considered and their diet in general better than under private employers before the war. ANGAU was fully aware of the value of native labour and co-operation to the Allied effort. [iii] A recent decision to issue a commemorative medallion to ‘surviving Fuzzy-Wuzzy Angels and the widows of surviving deceased Angels’ was a shameful attempt to deceive the public into believing the issue had been rectified. The difference between a ‘medal’ and a ‘medallion’ is that one is formally awarded for service to nation and the other is a ‘give-away’ with no formal status. [vi] Nameless Warriors – The Ben Moide Story. Lahui Ako. Sterling Publishers. 2012. Just curious but why no mention of the 24,000 Americans deployed to PNG plus the 100k who were fighting on Guadalcanal diverting Japanese resources? Did that not have an impact? It did indeed David – if the Japanese division had not been diverted to Guadalcanal the outcome of the Kokoda campaign and the security of Port Moresby would most likely have been a different story and the flag would not have been raised on Kokoda. I believe it is with Captain Bert Kienzle’s son ‘Soc’ who guards it with tlc in Cairns. Kokoda Conspiracy: World Heritage – Military Heritage?